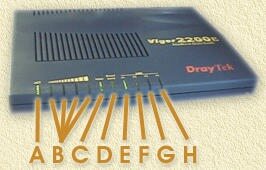 The Vigor 2200(E) is very suitable for a SOHO network. Just hook those computers to the Vigor and he will handle dial-up-networking to MXStream, DHCP, etc.! Ideal if you ask me,... and the current price of this unit is about 200 Euro (app. $220). 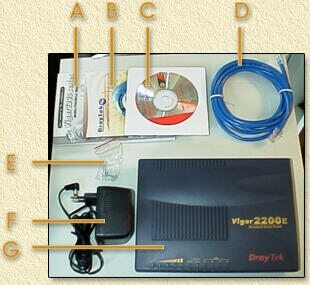 For the description on this page we only need the Ethernet cable (D), powersupply (F) and router (G). Note: it might be useful if you save or print this webpage right now, since you will be without Internet for a few minutes when connecting the router. Let's take a look at the LED's on the front-side of the router. The router is powered and the router-software is running OK.
4 LED's indicating the bandwidth used. Indicates that the ADSL/Cablemodem is Connected. Flashes at data transfer. Indicates ADSL/Cable connection to your provider. Port 1 is connected (orange = 10Mbps, green = 100Mbps), blinks while transferring data. Port 2 is connected (orange = 10Mbps, green = 100Mbps), blinks while transferring data. Port 3 is connected (orange = 10Mbps, green = 100Mbps), blinks while transferring data. Port 4 is connected (orange = 10Mbps, green = 100Mbps), blinks while transferring data. Uplink connector for an additional switch or hub (if you plan to use more than 4 PC's). Note that Port1 cannot be used simultaneously! PC LAN network - port 1. PC LAN network - port 2. PC LAN network - port 3. PC LAN network - port 4. Indicates active WAN connection (Ethernet only). Connection for a cable- or ADSL-modem. The WAN Led will briefly flash once, ACT Led remains blinking. Use standard UTP (preferable CAT5) cable for this. The led (Px) will be lit on active connection between router and PC-network-card. Most network-card (NIC's) have a similar led which should get lit too. Plug the supplied cable (a standard UTP network-cable) in to the WAN port connector of the router, and the other end of the Ethernet-cable into the "10Base T/MDI-X" connector of the Alcatel Ethernet modem (for details see PSTN and ISDN). The led on the backside of the Alcatel and the Vigor will lit (both devices should be switched on). The WAN Led of the Vigor will also lit. Start a webbrowser, for example Internet Explorer, on your PC and open address 192.168.1.1, a dialog appears asking for a "User name" and "Password", the default values are: "Username" = "admin" and "Password" remains empty (so don't enter anything here). The "Setup Main Menu" window opens. Click the "OK" button to apply the changes. The router might want to reboot - comply! If the router does not seem to need a reboot, click "<< Main Menu" to return to the main menu. 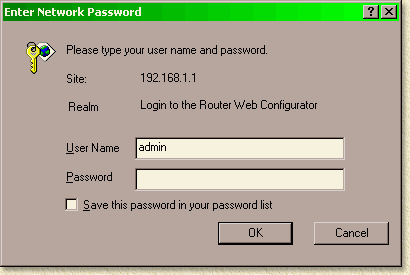 Enter your username here as provided by your ISP (as used for ADSL dialup). Enter your password here as provided by your ISP (as used for ADSL dialup). The Vigor will disconnect after an idle time of 7200 seconds (2 hours). TIP: Set this to "-1" if you have the most recent firmware, this way the router tries to stay connected for ever (thanks to Michiel for this tip!). You can select "Specify an IP address", as done by KPN. It appears however that "Obtain an IP address automatically" will work by default as well. That's because the default DHCP mode of the Alcatel modem is set to "Auto". After doing so, start, for example, Internet Explorer, and open a nice website, for example http://www.weethet.nl/english/welcome. You will notice the flashing of the LED's of the router, particular WAN and Broadband will Flash. The Broadband led indicates a successful dialup. If Broadband does not light up, you might have made a type at the Username or Password fields, check them!